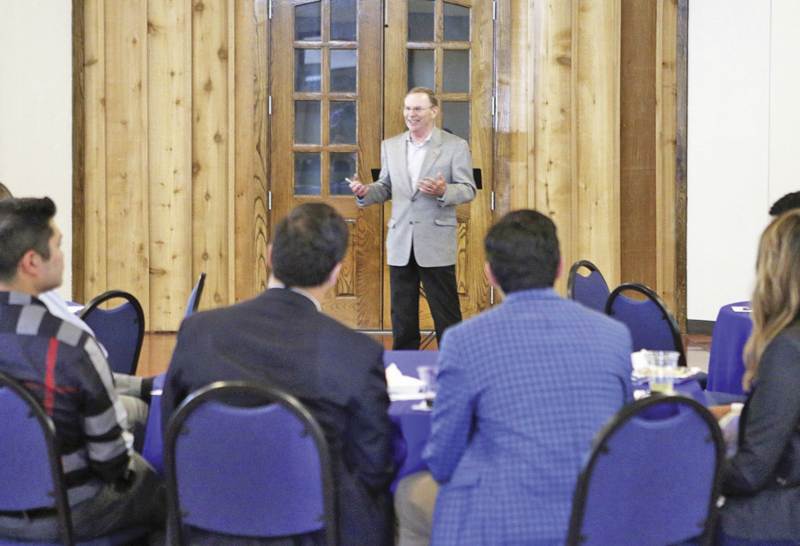 The McAllen Chamber of Commerce here recently revitalized a program to inspire local emerging leaders to become more involved citizens in the Rio Grande Valley. After a more than two-year hiatus, the McAllen Chamber of Commerce, in conjunction with the McAllen Economic Development Corporation, relaunched its Emerging Leaders series for young professionals to “connect and discuss their goals, ideas and career advancement objectives,” according to the meeting flyer. The meetings consist of guest speakers, networking among the attendees and discussing career goals over dinner. The series kicked off June 27 with McAllen Mayor Jim Darling as the first guest speaker. Gerry Garcia, vice president of special projects and government affairs at the chamber, said she wasn’t sure why or when the meetings stopped but was excited to bring the program back. The bi-monthly meetings help attendees “meet and learn from McAllen area progressive leaders, who will share their journey to success and how they overcame obstacles or handled career setbacks,” according to the meeting flyer. This was put into practice by Simon Cardenas, a community liaison for Doctor’s Hospital at Renaissance and one of the 20 or so emerging leaders at the meeting. He said being there helped him put words into action. “Something I was brought up with is that in order to be successful in life, you have to help your community be a success,” Cardenas said. The meetings are every two to three months, and while the speakers for future meetings have not yet been secured, Cardenas said he hopes to see people like city council members, organization leaders and local judges. The series targets professionals aged 22 to 35, Garcia said, because of the high population of younger people in the McAllen area. By creating connections between the city and a large local demographic, she hopes to create a cycle of support in which the leaders eventually help the city that pushed them forward professionally. “We want them to know they can be successful in McAllen,” Garcia said. During his speech, Darling focused on past and present problems the city has faced, such as immigration and flooding, Garcia said. Just like McAllen is working to resolve these issues and help those affected, Garcia said she, the chamber, the city and Darling want the program participants to see the city as a professional resource. Garcia hopes that with time, the emerging leaders make the meetings their own and she said she’s encouraged them to pitch ideas of what they want the meetings to consist of, who they want to hear speak and what they want to gain from it. To learn more about the program or attend a meeting, contact Gerry Garcia with the McAllen Chamber of Commerce at ggarcia@mcallenchamber.com or (956) 682-2871.